A recent Fox News piece reminded us that there has been clear collusion to derail a US presidential election, and it was not orchestrated by Moscow. Rather, it was backchannel collusion between Brits and Americans to defeat Donald Trump. In a London courtroom this week, lawyers for Christopher Steele, the former British spy and author of the Trump dossier, fought to protect his sources, which claimed the Kremlin had salacious and compromising information on Donald Trump. In March, Steele was ordered by the English High Court to appear for an upcoming videotaped deposition in London to be used as trial testimony in ongoing civil litigation against Buzzfeed for publishing the unverified dossier. Buzzfeed, the online publication, is being sued by Russian businessman Aleksej Gubarev in the UK and in Florida for publishing the dossier prepared by Steele and his company, Orbis Business Intelligence, that named companies owned by Gubarev, a technology executive. In the complex litigation, Buzzfeed, according to the Times of London, is now seeking to quiz Steele on “the dossier as a whole,” which is a change in tactics. “Shameful” was the word quoted by the British newspaper, attributing it to an anonymous associate of Steele’s company. Steele’s colleague, Chris Burrows…..
Fray-Witzer alleged that “Buzzfeed wants to pretend that it was reporting on some government investigation. It wasn’t. The Dossier wasn’t some government report, it was a bunch of memos written by a private opposition research firm hired to try to find dirt. But this goes way beyond “Fake News,” given the role of a prominent American in the last Administration. It clearly seems that Lt. Gen in the USAF and then Director of National Intelligence (DNI) James Clapper, conspired to furnish information, concocted by Christopher Steele a retired British MI-6 intelligence agent, to undercut the Trump campaign. James Clapper, while the nation’s highest ranking intelligence officer, leaked to CNN sleazy anti-Trump information contained in the Christoper Steele dossier that was privately briefed to the president-elect, according to a new House intelligence report. Now a paid CNN analyst, Mr. Clapper had denied he was the leaker. He is an ardent Trump critic and has predicted his downfall. 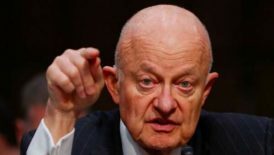 President Barack Obama’s director of national intelligence, Mr. Clapper admitted to the House Permanent Select Committee on Intelligence in private testimony that he briefed CNN’s Jake Tapper in early January 2017. He had pressed FBI Director James Comey to present to Mr. Trump at Trump Tower on Jan. 6, 2017 the dossier’s salacious parts, according to Mr. Comey’s own memos. CNN then ran a story on Jan. 10, 2017 about the briefing which said the Russians own compromising material on the new president concerning prostitutes in a Moscow hotel room. The report gave the dossier instant legitimacy. Its unverified charges have dogged the Trump White House ever since. Mr. Steele, an British ex-spy, was paid by the Democratic National Committee and the Hillary Clinton campaign. The CNN report made no mention of its partisan origins as opposition research, although the intelligence community knew this at the time. CNN received the prestigious Merriman Smith Award on Saturday for its Jan. 10 story at the annual White House Correspondents dinner. Mr. Clapper had urged the Trump briefing, then leaked the information to CNN, which ran the story. Mr. Clapper later was hired by CNN as an analyst, and CNN won an award for the story based on his leak. The Clapper admission is contained in the final Russia election report by the House Permanent Select Committee on Intelligence. The Republican majority concluded there was no election collusion between the Trump campaign and the Kremlin. “Clapper subsequently acknowledged discussing the ‘dossier with CNN journalist Jake Tapper,’ and admitted that he might have spoken with other journalists about the same topic,” the committee report said. Committee Republicans said that the CNN report was the spur that prompted the news website BuzzFeed to post the entire 35-page dossier on Jan. 10, 2017. Mr. Clapper joined CNN in August 2017, a month after his committee testimony. He said on CNN earlier this month that he had not spoken to any reporters until after he retired as director of national intelligence. These four journalists and a number of other CNN reporters broke the story that the intelligence community had briefed President Barack Obama and then-President elect Donald Trump that Russia had compromising information about Trump. The CNN team later reported that then-FBI Director James Comey personally briefed Trump about the dossier. Thanks to this CNN investigation, ‘the dossier, is now part of the lexicon. The depth of reporting demonstrated in these remarkable and important pieces, and the constant updates as new information continued to be uncovered showed breaking news reporting at its best. The citation omits the fact the dossier was unverified opposition research….. Looking back in history we have other such attempts to influence US policy. The Cambridge spies come to mind with the role of Donald Maclean working within US intelligence to shape core judgments within the US government. Maclean served in Washington from 1944 to 1948, achieving promotion to First Secretary. Melinda Maclean was again pregnant, giving birth to a son in New York City. The Macleans frequently visited Melinda Maclean’s mother and step-father in Manhattan and at Dunbar’s country place in the Berkshires and vacationed on Long Island and Cape Cod with Mrs. Dunbar and Melinda Maclean’s sisters. The Macleans became part of the liberal Georgetown social set in Washington, which included Katharine Graham, as well as participating in the diplomatic life of the city, Donald Maclean playing tennis with the Ambassador. Towards the end of that period Donald Maclean acted as Secretary of the Combined Policy Committee on atomic energy matters. He was Moscow‘s main source of information about US/UK/Canada atomic energy policy development. Although Maclean did not transmit technical data on the atom bomb, he reported on its development and progress, particularly the amount of plutonium (used in the Fat Man bombs) available to the United States. As the British representative on the American-British-Canadian Council on the sharing of atomic secrets, he was able to provide the Soviet Union with information from Council meetings. This gave Soviet scientists the ability to predict the number of bombs that could be built by the Americans. Coupled with the efforts of Los Alamos-based scientists Alan Nunn May, Klaus Fuchs and Theodore Hall (who had been identified but was allowed to remain at large), Maclean’s reports to his NKVD controller gave the Soviets a basis to estimate their nuclear arsenal’s relative strength against that of the United States and Britain. In addition to atomic energy matters, Maclean’s responsibilities at the Washington embassy included civil aviation, bases, post-hostilities planning, Turkey and Greece, NATO and Berlin. Looking back further in history we have the UK-US tandem of General Benedict Arnold and Major André working to affect outcomes in American history.Benedict Arnold (1741-1801) was an early American hero of the Revolutionary War (1775-83) who later became one of the most infamous traitors in U.S. history after he switched sides and fought for the British. At the outbreak of the war, Arnold participated in the capture of the British garrison of Fort Ticonderoga in 1775. In 1776, he hindered a British invasion of New York at the Battle of Lake Champlain. The following year, he played a crucial role in bringing about the surrender of British General John Burgoyne’s (1722-92) army at Saratoga. Yet Arnold never received the recognition he thought he deserved. In 1779, he entered into secret negotiations with the British, agreeing to turn over the U.S. post at West Point in return for money and a command in the British army. The plot was discovered, but Arnold escaped to British lines. John Andre — handsome, artistic, beloved by the Loyalists, admired by Washington … a spy brave and cunning … convinced Benedict Arnold to sell out West Point … hanged at age 31. John Andre was born in London in 1750 to French Protestant (Huguenot) parents. His father was a merchant, born in Geneva, Switzerland; his mother was born in France and moved to England when she was young. He attended school in Geneva, returning to London in 1767, two years before his father died. What we have in the Clapper-Steele team is even worse. Here a key US intelligence official used his ties with foreign intelligence to work to shape the outcome of a free election, not in some distant land, but in his own. What we seem to know is that Clapper worked with British spy to generate disinformation and to circulate to the US media as real information. But what remains to be determined is the relationship between UK and other allied intelligences and US intelligence in playing this role. According to an article published in the Guardian on April 13, 2017 is that there may well have been a role. The article interprets this foreign spy intervention as relatively positive as it was “exposing” activities of the Trump campaign team. But given the doggy nature of the “Steele file,” it is more a question of the US spymaster used his foreign sources to generate information coming from outside the United States to influence political events. This is a dramatic set of actions, which may make historical examples pale by comparison.